This double-sided hanging was described as a 'real innovation' by the jurors of the Exposition Universelle at Paris in 1900, where it was awarded a gold medal, and its weaver and designer, Frida Hansen, director of the DNB, given special praise. It was designed to hang in a doorway and to be semi-transparent. The hanging was acquired directly from the Exposition for this museum. Awarded a gold medal at the Exposition Universelle at Paris in 1900. Designed to hang in a doorway and to be semi-transparent, the fragility of this heavy hanging means it must now be supported on a backboard. At the time of the manufacture Frida Hansen was the Artistic Director of 'Det Norske Billedvoeveri'. 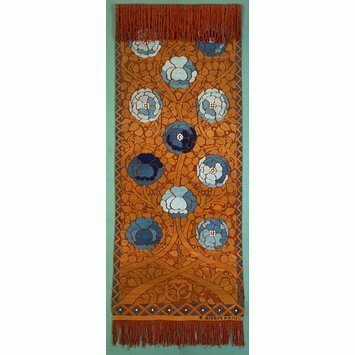 Woven tapestry door curtain, designed by Frida Hansen, made by Det Norske Billedvoeveri; Norway (Oslo), 1900.